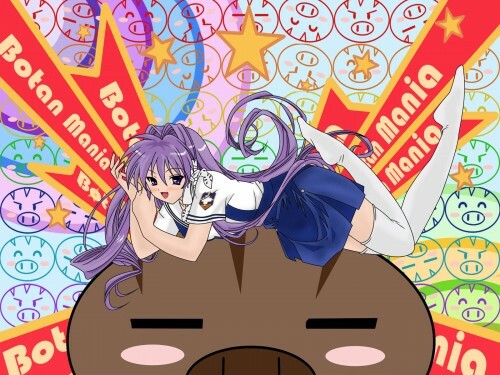 Minitokyo »	Clannad Wallpapers » Clannad Wallpaper: Botan Mania!!! A wallpaper made from the Kyou Vector I did the other day. It would be nice if it was a Fuuko Wallpaper because of the Stars >_> The Background idea was taken from the part where Tomoya imagines Kyou being a Magical Girl. A somewhat "Fun" wallpaper. Constructive criticisms are welcome. Hehe, this is cool. I haven't seen this series yet. The background is neat, and same with the layout. A few things: 1. With that big brown thing (I'm not sure what it is...lol, sorry. Still have to watch this series, remember OX ) the eyes look a little jaggy, same with the spots under it's eyes. The brown in it's nose also doesn't touch the black outline. 2. With the girl, some of the color bleeds out onto the brown thing. The vector itself of her is really good! Good work. Hope what I said helped.. I think the vector is pretty cool, maybe the soft shading in places don't fit too well. But yeah, looks pretty good on how you did it all together. Nice job of the fixes! It looks really great!